The Pilgrims come to New England, riding a wave of uber-orthodox religious fervor. Christmas is not a recognized holiday. Instead of getting their jollies on with some hearty cups of eggnog (like Captain John Smith's heathens did down in Jamestown back in 1607), the Pilgrims spend December 25th building shelter. Oh, what fun! Governor Bradford recognizes that some of his Plymouth settlers, specifically those who are sympathetic towards the Church of England (later known as the Episcopal Church), want some time off on December 25th so that they can worship at home. But when the governor discovers these same settlers playing games out in the street on Christmas Day (instead of devoting their attention to the divine), everyone is ordered back to work. The General Court of the Massachusetts Bay Colony officially bans the celebration of Christmas. The Court also places bans on other holidays, gambling and essentially all forms of merrymaking. According to Court records, anyone who is caught "observing any such day as Christmas or the like, either by forbearing of labor, feasting, or any other way" must pay a fine of five shillings to the county "for every such offence [offense]." A glimmer of hope! After two decades of Grinch-like rule, the English-appointed governor, Sir Edmund Andros, lifts the ban on Christmas. However, despite Christmas regaining its legality, the Puritan spirit prevails and the majority of New Englanders continue to abstain from Yuletide celebrations. Reverend Cotton Mather (son of Reverend Increase Mather, who was involved in the Salem Witch Trials) condemns the "wanton Bacchanalian" that is Christmas. According to Mather, Christmas is "dominated by a lord of misrule, who did not hesitate to invade the churches in a time of service..." Despite this condemnation, New England's Church of England/Episcopal Church congregations openly celebrate the December holiday. A few New Englanders from other congregations participate in the Christmas festivities, but the puritanical Congregationalists continue on with their abstention. In Connecticut, Hartford's Brick Meeting House, which also serves as the city's First Congregational Church, holds its inaugural Christmas service. The Hartford Courant endorses this progressive move, citing, "It has been the wish of many pious people among those whose form of worship differs from the Episcopal Church that the day which gave birth to the Saviour of the world should be generally commemorated by appropriate religious services." 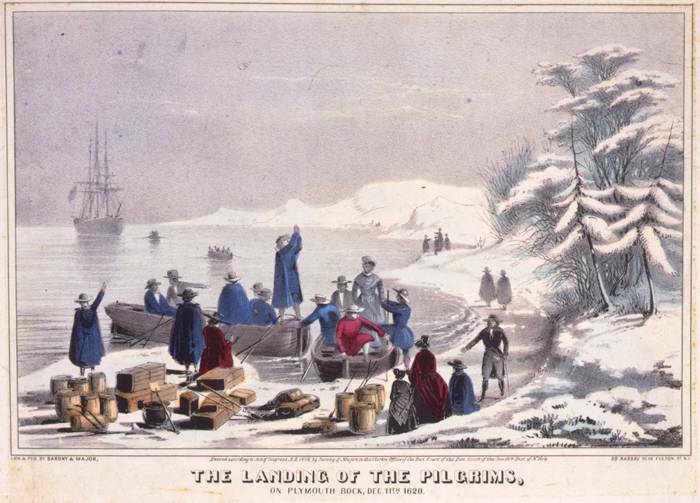 Throughout the 1820s and 1830s, Christmas celebrations become more widely accepted across New England. German immigrant and Harvard professor, Charles Follen, introduces the tradition of the decorated Christmas tree to New England during a party at his Cambridge home. However, instead of setting up an evergreen tree on the floor in the corner of a room, Follen set up his tree on the dining table. Christmas is declared a federal holiday on June 26th; the Puritan war on Christmas in New England is officially over.